Are you looking for ways to paint stainless steel, but are finding that the products you are using don’t adhere to the surface? 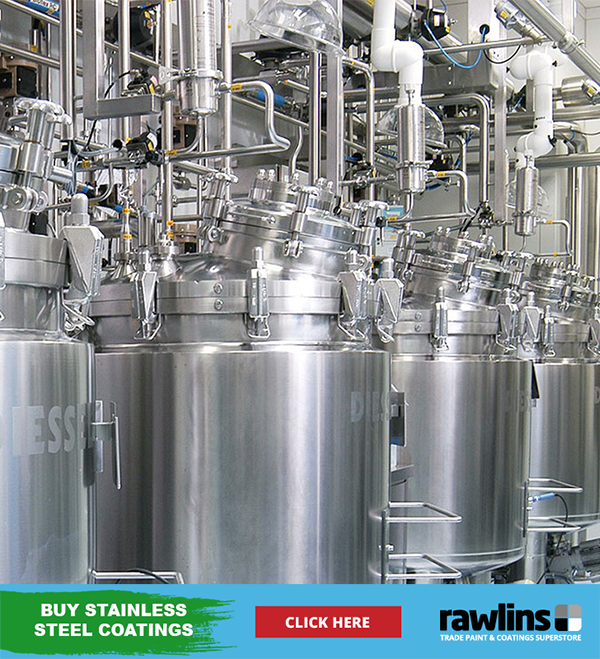 Rawlins Paints take a look at the best stainless steel paints and primers for commercial and industrial purposes. The advice and product recommendations in this article are commercial, architectural, construction and industrial solutions to painting stainless steel, and not for small personal projects or common kitchen items, like kettles or toasters. Direct to Stainless Steel Paints. Stainless steel is a form of steel that contains chromium. It is commonly used for commercial and industrial purposes due to its corrosion resistance toward tarnishing or rusting. The chromium forms a thin layer of oxide on the steel’s surface, known as a passive layer. This chromium ‘passive layer’ protects the steel from common forms of corrosion. Other elements often found in stainless steel, include carbon, silicon and manganese. Nickel and molybdenum is sometimes added to further improve rust resistance, or surface deterioration in more corrosive environments. Stainless steel is only stain-resistant in normal atmospheric environments. In more aggressive conditions, it may corrode – which is where the industrial primers discussed later in this piece can further improve the anti-corrosive qualities of the metal. 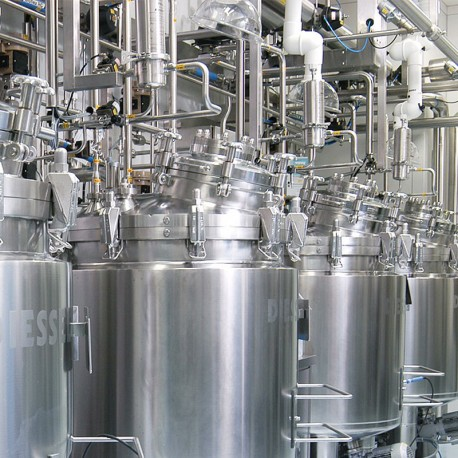 Along with the benefits of non-extenuating circumstances’ corrosion resistance, stainless steel has an aesthetically sound finish, popularly used for large scale commercial equipment. There are five types of stainless steel; Ferritic, Austenitic, Martensitic, Duplex and Precipitation Hardening (PH). Common stainless-steel finishes include polished, brushed, blasted, etched or a coloured finish. Rough surface finishes, however, offer lower corrosion resistance. Stainless steel is typically renowned for its own unique and ‘natural’ finish, but may, on occasion, need recoating to gain improved heat resistance, chemical resistance, or simply to meet a new colour scheme. 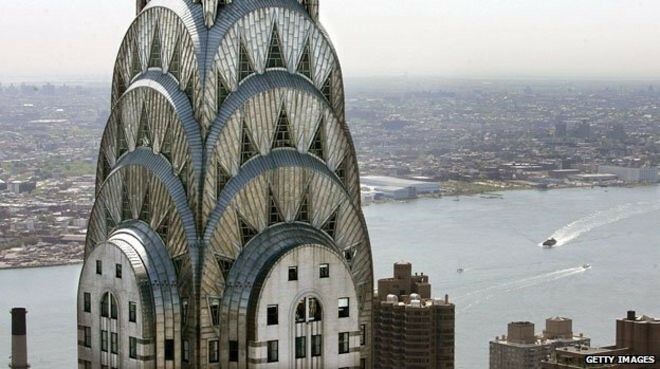 Typically, it is stainless steel components or structures that require a new paint finish to match company colour schemes and branded logos, or to improve environmental blending and compatibility. The product recommendations given are from the UKs leading industrial paint brands, are all 100% dependent on the environmental conditions and atmospheric exposure levels – hence the need to use a primer in most scenarios. Some stainless-steel paint systems can be applied that will leave a metallic finish – typically aluminium – and it is generally recommended to properly prepare the surface and apply a primer before adding a topcoat. Below, Rawlins Paints will look at product recommendations for cleaning, priming and adding a topcoat to stainless steel, as well as one product from Rust-Oleum which delivers a stainless-steel finish effect. If you require any further assistance with products discussed, please leave a comment at the end, or contact Rawlins Paints directly by phone/email. Additional note – paints that contain metallic zinc (please check product data sheets if in doubt) should not be used as a primer or one coat paint system on stainless steel. This can cause embrittlement of the stainless-steel substrate in the event of a fire. 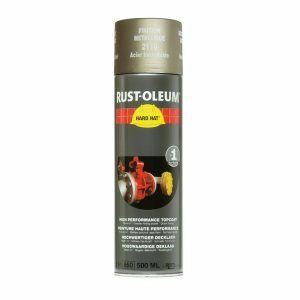 Rust-Oleum X1 Stainless Steel Cleaner is an excellent product for cleaning stainless steel, without abrasion, dulling or etching the surface. Through a gentle foaming action, upon application it will clean, degrease and polish the stainless steel, leaving a thin, anti-static film that is dry to the touch. 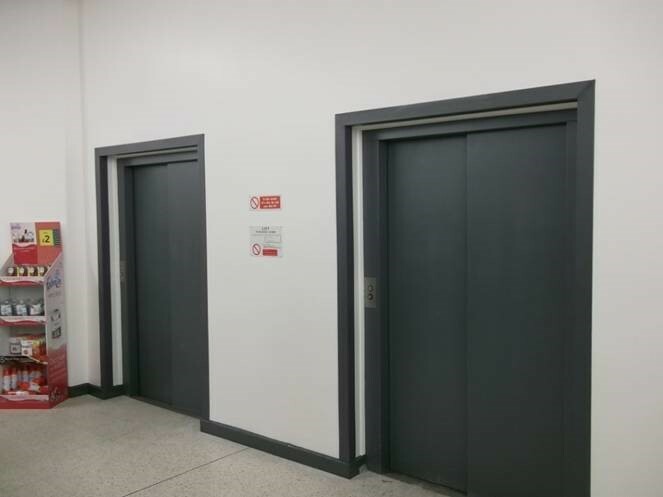 Whilst not designed for large scale cleaning, Rust-Oleum X1 Stainless Steel Cleaner can be used on control panels, lift doors, and handrails, as well as other vertical, smaller scale commercial projects. Ideal for public areas, it protects the surface from fingerprints, grease, water-staining and corrosion. On the move? You can find all our stainless steel paints together on our website. Another Rust-Oleum product, Hard Hat 2116 Stainless Steel Coating, is a quick and effortless way to get ‘that’ metallic finish. As with all Rust-Oleum products, the aesthetical properties are combined with a protective element, in that the stainless-steel finish will be chemically and mechanically resistant to scratches and dulling. It is recommended that a Hard Hat primer is used to prepare the surface, prior to applying Hard Hat 2116 Stainless Steel Coating – to get optimal coverage and adhesion. This product is ideal for light industrial exposure, touch-up and maintenance work, recoating machinery, pumps, toolboxes and related garage/warehouse apparatus. All surfaces must be properly cleaned and any rust removed prior to use. Metal primers available at Rawlins Paints for stainless steel range in price and project scale. Not all primers will work on stainless steel or smooth, dense surfaces similarly difficult for coatings to adhere to. Below are recommended metal primers for stainless steel when application of a topcoat is required. Jotun Penguard Primer is designed for new construction. It is a two-component polyamide cured, high-molecular weight epoxy coating which can be used as a stand-alone primer, or as part of one of Jotun’s metal paint and coating systems. This primer differs from most in that it can be used as part of an immersed or atmospheric environment, on prepared carbon steel, aluminium, concrete, galvanised steel, shop-primed steel, thermally sprayed zinc substrates, and stainless steel. It is highly recommended for use on structural steel and piping, too, along with stainless steel surfaces on offshore environments, refineries, power plants, bridges, buildings, and mining equipment. On stainless steel, the surface, at a minimum, should be hand or machine abraded with non-metallic abrasives, bonded fibre machine, or hand abrasive pads – to impart a scratch pattern to and removing all polish from the surface. Recommended application and use is after the surface has had abrasive blast cleaning, so that its profile is sharp and angular. Note that the coating will be resistant to various immersion temperatures depending on the specific chemical and whether immersion is constant or intermittent. Heat resistance is influenced by the total coating system. If used as part of a system, ensure all coatings in the system have similar heat resistance. Sika Permacor 2706 EG can be used as primer for stainless steel, as well as galvanised steel. It is available as a 2-pack mio-protective coating based on epoxy resin with high mechanical resistance and outstanding adhesion. Surface preparation of stainless steel includes sweep-blasting the surface according to EN ISO12944, part 4 with non-metallic/non-ferrous abrasives. For contaminated and weathered surfaces, it is recommended that the surface is cleaned with SikaCor Wash.
SikaCor EG 1 is a mechanical, water and chemically resistant coating system for use of stainless steel, providing durable corrosion protection in line with corrosivity category C5-1 resp. C5-M, protection duration ‘high’ according to DIN EN ISO 12944-5. As part of Rust-Oleum’s CombiColor range, the popular 3302 CombiPrimer can be used in preparation of stainless steel, prior to a metal topcoat system. Extremely efficient in making difficult surfaces suitable for recoating, CombiPrimer can also be used on glass, copper, porcelain, and other dense surfaces which standard paint topcoats cannot adhere to. Prior to applying CombiPrimer, ensure all surfaces are removed of grease, oil and other surface contaminations, by alkaline or high pressure/steam cleaning in combination with appropriate detergents. Remove salts, ‘white rust’, etc. by washing with Rust-Oleum Surfa-Etch 108 Etching Solution. The surface must then be clean and dry before application. Another Rust-Oleum metal primer for stainless steel – which is also available in the full RAL colour range, as opposed to the limited to translucent blue option with 3302 CombiPrimer – is 3202 Galvinoleum Primer. This is available as brush applied, single-pack super-adhesion primer. Suitable for stainless steel, glass, copper and other smooth surfaces, the colour options are specifically available to improve the coverage and performance of its compatible topcoats – and, as opposed to the exact match RAL topcoat colours, these ‘surface primer colours’ are not truly representative of, for example RAL1014 Ivory. As with all recommended metal primers, the surface must be prepared and cleaned prior to application. International Intertherm 228HS has been specifically designed to provide a corrosion resistant barrier when used to protect steelwork beneath thermal insulation in areas subjected to wet and dry cycling – including insulated and uninsulated carbon and stainless steel for use on the exterior of pipework, process vessels etc., operating at temperatures up to 230°C (446°F). It provides excellent resistance to thermal shock, which can be experienced during rapid temperature cycles. Like Jotun Pengard Primer, this metal primer for stainless steel is suitable for demanding industrial environments. Stainless steel is an oxymoron, in that it can stain, corrode and rust in extreme atmospheric or contaminated environments. Different to the cleaning of rust from small utensils, large surface areas of stainless steel which have begun to corrode or rust need a differently scaled solution. Stainless steel cleaners, covered earlier in this article, can help slight discolouration and contamination that is causing the substrate to rust or corrode. 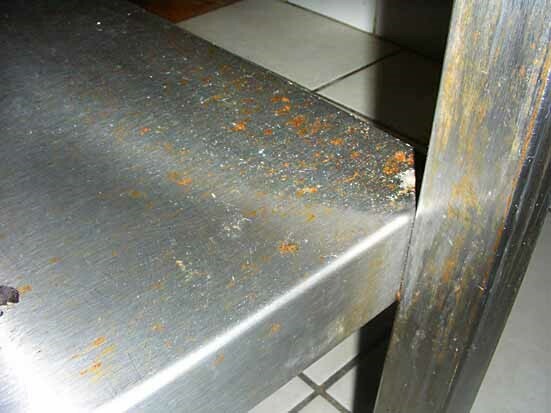 Ultimately, however, maintenance of the conditions around the stainless-steel apparatus, equipment or structure may be key to removing the risk and spread of rust across the surface. Any damage or corrosive chemicals that have met the stainless steel should be dealt with – cleaned or repaired – and ongoing exposure removed. Steel will rust and when the chromium surface layer on stainless steel is breached or damaged, the underlying steel will be exposed to rust. Via cleaning and ‘care’, the top chromium oxide layer is self-healing. Do not use steel wool or steel brushes when cleaning the surface. 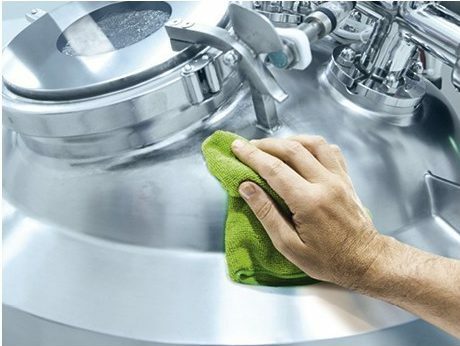 For general and quick cleaning of stainless steel, to lift non-oxidised soils, durst, dirt and fingerprints, a mild soap and warm water solution will suffice until a more competent and recommended cleaner can be used. Any direct-to-stainless steel paint will specify that the surface must be prepared prior to application. For successful coverage and to obtain the full lifespan of a direct-to-metal product on stainless steel, it is highly recommended that a primer is used – as previously discussed. However, for prepared stainless steel, the following paints are suitable for stainless steel – please refer to a product datasheet always prior to application to ensure that the full steps and measures required in surface preparation are completed. Jotun Jotacote Universal N10 can be applied to and is suitable for properly prepared stainless steel, and can be applied at sub-zero surface temperatures – such as on ballast tanks, cooling tanks, and equipment found in pharmaceutical and science departments. This two component amine-cured pure epoxy coating can be used as a primer, mid-coat, finish coat or single coat system. This product is replacing the current Jotacote Universal product. There will be occasions where optimum surface preparation is not possible – this could be due to the downtime required to complete the task – and a direct to substrate coating is required. 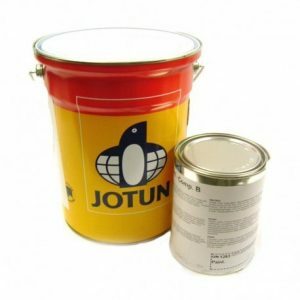 Jotun Jotamastic 87 is one of the few recommended products which can be applied to unprepared areas. It will provide long lasting protection in atmospheric areas with high corrosivity, including offshore developments and installations, coastal and docks locations across the UK. Ideal for repair and maintenance of stainless steel, it can act as a single coat system in immersed environments and sub-zero temperatures. Similarly, Jotun Jotamastic 90 GF is a two component polyamine cured epoxy mastic coating, reinforced with glass flakes for improved abrasion and scratch resistance. It is ideal for surfaces exposed to considerable wear and tear from pedestrianised high-traffic areas. Another Jotun product, this time Jotun Solvalitt – available in white or black (see Jotun Solvalitt Alu for the aluminium finish and Jotun Solvalitt Zinc for the grey finish) – provides heat resistance on properly prepared carbon steel, galvanised steel and stainless steel for temperatures up to 400°C. Jotun Solvalitt Midtherm Alu provides heat resistance up to 260°C. These Jotun Solvalitt products are suitable for insulated and non-insulated surfaces, after they have been primed with an inorganic zinc silicone coating first – Sherwin-Williams Zinc Clad II EU is a self-curing solvent based, two component zinc silicate coating. Alternately, Interplate® 937 from International, is a two pack, heat resistant zinc silicate shop (pre-construction) primer providing good corrosion protection (even after heating up to 800°C (1472°F)). Jotun Epoxy HR is a two component polyamine cured novolac epoxy coating that is heat resistant up to 200°C and can be applied on hot substrates up to 150°C. Available in aluminium or light grey finished, it can be used as a primer, mid-coat or finish coat in atmospheric conditions on properly prepared surfaces, including stainless, carbon or galvanised steel. The highest heat resistance available from a Jotun product is Jotun Jotatemp 1000 Ceramic, which is heat resistant up to 650°C continuously and 720°C intermittent. Please note that the heat resistance stated will differ per substrate – for further advice, contact Rawlins Paints’ technical support team, or refer to each products’ data sheet. Once a suitable metal primer has been applied to stainless steel, a metal topcoat/finishing coat can be applied. Most primers that have been recommended come as part of a manufacturer system, with the topcoat being fully compatible with the primer. Please contact Rawlins Paints if you require a colour or finish that is not available in any of the paint systems discussed above – which do contain topcoats tintable to the full RAL colour range. 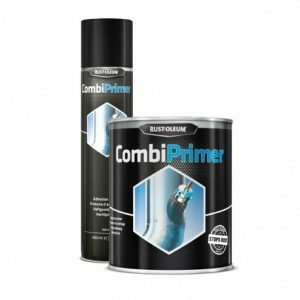 The primer, in collaboration with a suitable topcoat are designed to deliver protective systems which can fail if an unsuitable topcoat is used. For example, using a standard topcoat on a heat resistant primer will not make the finished installation heat resistant. As the main manufacturer recommendations are Jotun and Sika, there are full systems available with alternate topcoats to meet application needs in low temperatures, for example, or to give metallic finishes as opposed to those obtained from standard RAL colours. If you are unsure, or would like to share the project/environment/atmospheric conditions in the comment section below, we will happily recommend primer and topcoat combinations, or one-product installations that meet your requirements. Please note that Rawlins Paints will not be able to make domestic or small household appliance recommendations due to the scale specifications of the products available and their intended purposes in the architectural, commercial, off-shore/marine and industrial sectors. These are the best tips to clean and paint stainless steel products. This guide explains how to clean, prime and paint construction, architectural, industrial, and the commercial and retail sector’s everyday usage of stainless steel on surfaces. Keep Sharing..! !